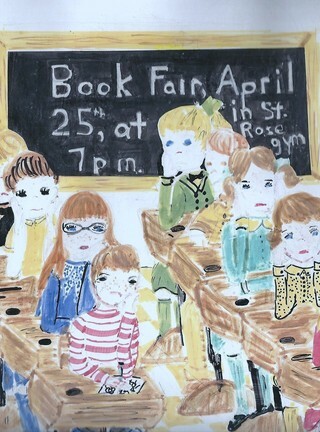 This is an illustration detail from a poster I made in elementary school for a Library Book Fair. It included a poem which I wrote. The poster won a prize and I guess you could say it was the beginning of my combining illustration, writing and libraries. I received a small set of oil paints when I was 12 or 13 and painted this picture of my Grandparent's farmhouse in New Prospect, Wisconsin. 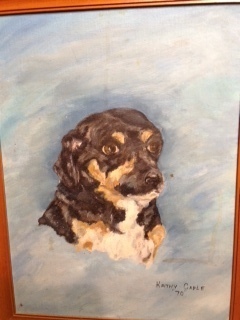 I painted this picture of my Grandfather's dog. He liked it so much he gave me $50.00 and told me I was now a professional. "The Bingity-Bangity School Bus" by Fleur Conkling, illutrated by Ruth Wood, and published by Wonder Books, was one of my favorite childhood books. My father read this again and again to me and my sister, Margaret. He eventually invented some of his own lines and sound effects. I found this copy in a used book store a few years ago. Every book is a challenge. I go through an amazing number of small drafts and dummies to get to the final product. This was my first published book.